World-famous air racer Dusty Crophopper (Dane Cook) learns that his engine is damaged, putting his racing future in jeopardy. After a fire at his airport, Dusty and his friends are told that their airport will be shut down, due to their fire department being severely out of date, and not up to code. With their corn festival coming up, this would be devastating to the town. Dusty, distraught about his engine, but not wanting to completely give up, volunteers to become the second firefighter, allowing the airport to reopen. Dusty is sent to Piston Peak Nation Park to become certified as a firefighter. He is told to ask for Blade Ranger (Ed Harris), a seasoned veteran, who will prepare him for his new career. When Dusty arrives at Piston Peak, he meets the brave fire and rescue team who work there; Dipper (Julie Bowen), who is obsessed with Dusty, Windlifter (Wes Studi), Cabbie (Dale Dye), Maru (John Michael Higgins), the resident mechanic/magic worker, along with the Smokejumpers, the all-terrain vehicles tasked with jumping into fires to help from the ground. Blade Runner isn’t as impressed or awestruck with Dusty as the rest of the crew. He is a no-nonsense kind of guy/helicopter, who takes his job very seriously. He doesn’t think Dusty has what it takes to be on a fire and rescue crew. Nonetheless, he trains Dusty in the art of firefighting, constantly pushing him. When a massive wildfire breaks out in Piston Peak, Dusty, Blade Ranger, and the rest of the team are put to the test. They must stop the fire and save all the tourists in the park. To be fair, I have not seen the original Planes. From what I hear, though, it is a cheap ripoff of Cars. Only, it’s the “world above” Cars. To be completely honest, I have yet to see Cars from beginning to end. Luckily, Planes: Fire and Rescue gives you enough hints that you don’t need to see the original to know what is going on. Especially if you know how Disney works. Dusty Crophopper was, I’m assuming, a lowly crop duster who rose to fame as a plane racer (if that is such a thing), surely outclassed by those he was racing against. In Act 2, we see Dusty on a bit of a backslide. His engine problems threaten the very life he loves. As with any Disney hero, he steps up to fit in any way he can. In this instance, he sacrifices his lifestyle to keep the airport open as a firefighter. A noble cause, to be sure. The story is predictable, if you’ve been paying attention to any Disney movie ever made. You are given set up after set up to clue you in to exactly what is going to happen at the end. And, sure enough, it delivers exactly what you expect. To put as many people in the theaters as possible, the cast is packed full of stars. Everyone from Julie Bowen (Modern Family) to Brad Garrett (Everybody loves Raymond), Teri Hatcher (Desperate Housewives) to Stacy Keach (Nebraska). Julie Bowen’s Dusty-obsessed, to the point of scary, Dipper is probably the most memorable. Since the actors are all just lending their voices to animated characters, most likely recorded individually, they all perform well. You don’t get the same connection you would if we got to see them interact. Nonetheless, you get exactly what you expect from the sequel. What is probably most impressive about the movie are the visuals. Disney is no slouch when it comes to animation. They have obviously been hard at work on their fire and smoke animator. It almost looks real. This would be the reason to see it in the theater. More than likely, your kids will love the movie. My 5-year-old, who was disappointed with the original, enjoyed it. As a parent, there are a few jokes thrown in to keep us sitting through the movie, just not as many as I would have hoped. 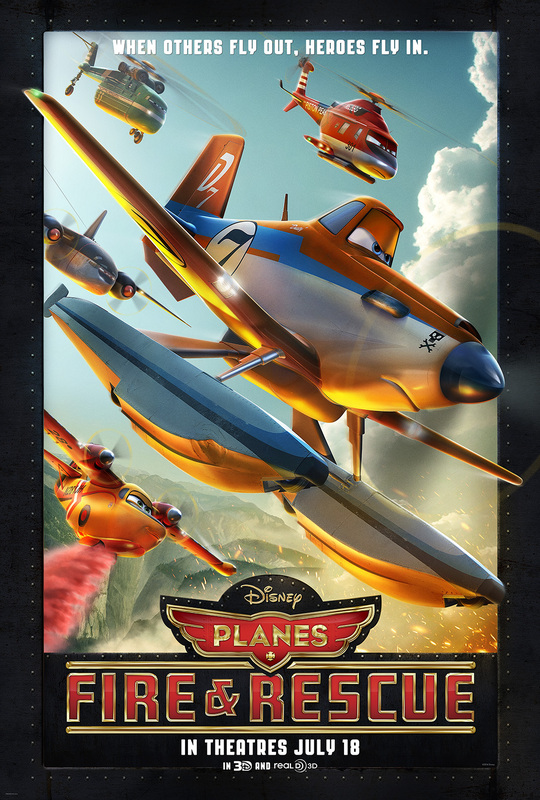 Planes: Fire and Rescue won’t have the staying power of other Disney blockbusters, but it’s not painful to sit through.